Despite a glittering legacy that traces its roots to the dawn of the Middle Ages, Armenian literature today has reached a crisis point. While the current political, cultural, and socioeconomic situation of the Armenian people can as ever benefit from the potential wisdom and guidance provided by Armenian literature, it continues its alarming decline – in terms of both output and quality, and in Armenia and the Diaspora alike. Be that as it may, it is sometimes apt to utterly debunk suspicions of its demise by producing works, rare as they have become, which can single handedly restore, even exceed, the great promise of Armenian literature. 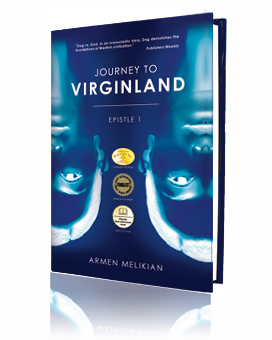 Thus, in 2012, Armenian writing received a splendid electric shock with the publication of Journey to Virginland, a genuinely revolutionary novel penned by Armen Melikian. With this novel, the first Epistle of a trilogy, Melikian turns Armenian literature upside down by shattering the taboos, slaughtering the sacred cows, and trumping vestiges of literary convention. But whereas in less-adept hands such an endeavor would run the risk of devolving into banal, inconsequential shock and awe, Melikian effectively helps transform Armenian writing into a wondrous force field of philosophical reckoning, cultural recalibration, and sheer storytelling prowess, once again enabling it to reclaim its role as a powerful agent of collective introspection and, ultimately, meaningful change. Looking for some of the best Armenian Literature? Get your copy of Journey to Virginland today!